Lurie Garden, that’s where we hit our stride. A midwest prairie in the middle of a city. On top of an invisible tower of parking garages layered above railroad lines and a Meta station. Like cat burglars casing a prospect, we loitered and poked. 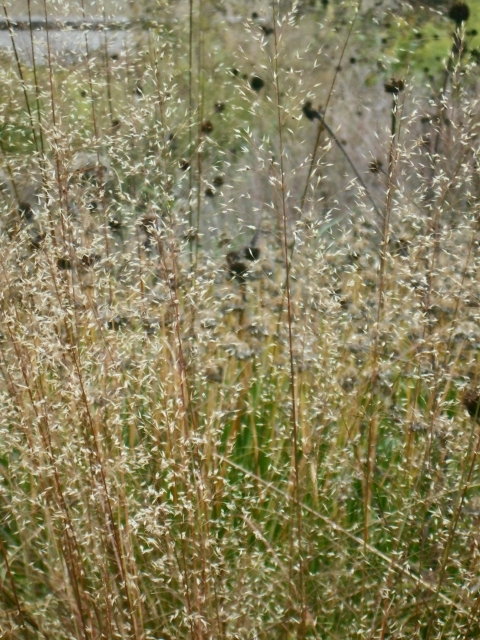 Even on this foggy gray day, muted earthtones dominating, dried grasses and perennials were by turns velvet, exuberant, or elegantly scruffy against a steel and glass skyline that disappeared into the clouds. So many seedheads and so little bloom tested our ID skills. Coneflower, Russian sage, aster and bottle gentian in bloom. Northern sea oats, eryngium, false indigo, amsonia, and “we-should-know-that-one” gone to seed. There’s a hush here on this postage-stamp plain that’s bounded on two sides by a massive, rolling evergeen hedge, pause between wild garden and skyscraper. Lots of symbolism going on. 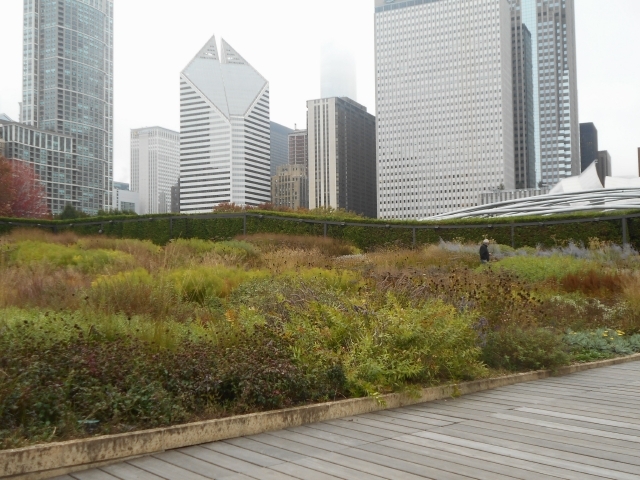 The garden was designed to pay homage to Chicago’s motto, Urbs in Horto, City in a Garden. The “shoulder” hedge is a physical depiction of Carl Sandburg’s City of Big Shoulders, his poem about Chicago’s valiant workers. 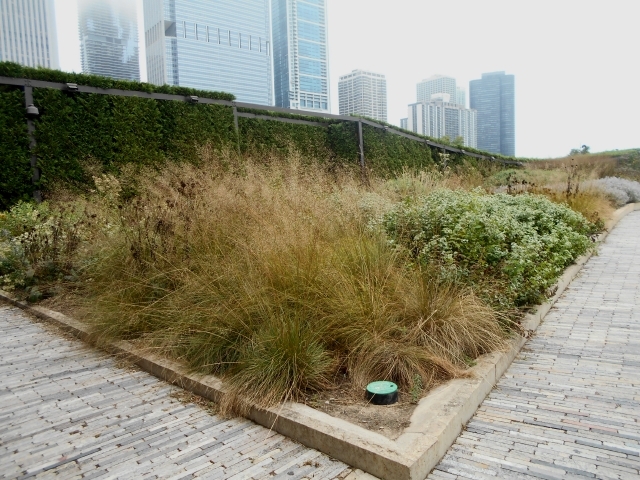 There’s a “light plate” planted with sun-loving perennials and grasses that represents Chicago’s bright future, and a “dark plate” with a canopy of shrubs and trees for shade plants that hearkens to Chicago’s past. They’re divided by a long and graceful footbridge over a shallow canal that follows an old escarpment along Lake Michigan. Well, we missed all that. After our first impressions, what we thought was: How do they do it? 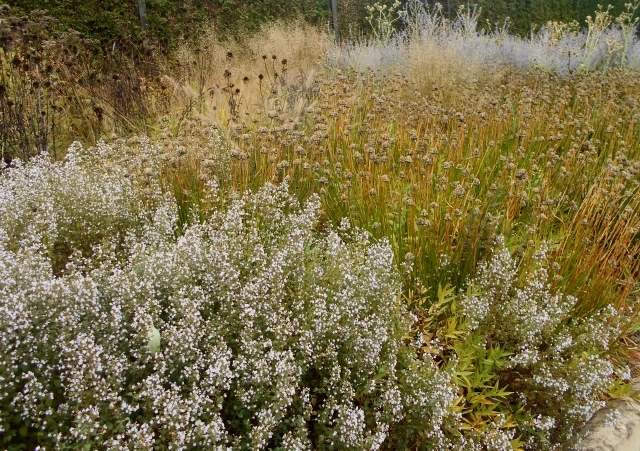 Why don’t our “informal” gardens look this good in October? Mine are sticky stalks and crumpled seedheads left as treats for rummaging winter birds (who, I suspect, prefer waiting on line at our fast-food feeders to teetering on wobbly sticks). Susan’s is tamer. She cuts her perennials down before inevitable New Hampshire snows turn them to mush. Our guess is that nobody hunted for bargains in big box stores and then spent a day wandering the garden looking for a place to plunk languishing waifs. With a budget of 13 million dollars, or 2-1/2 million per acre, landscapers and engineers could do it right. Take soil and drainage. Don’t go to sleep on me now, it’s quite a challenge to design a five-acre garden roof on top of parking garages. Soil here is an exquisitely engineered layer cake of sand, light-weight geofoam, and topsoil underlain by a waterproof membrane. Excess water drains through the long canal that divides the light and dark plates. When necessary, the garden is watered by a system of computer-controlled drip irrigation, pop-up sprinklers and overhead misters. Then there is the exquisite perennial design by Piet Oudolf of The Netherlands. 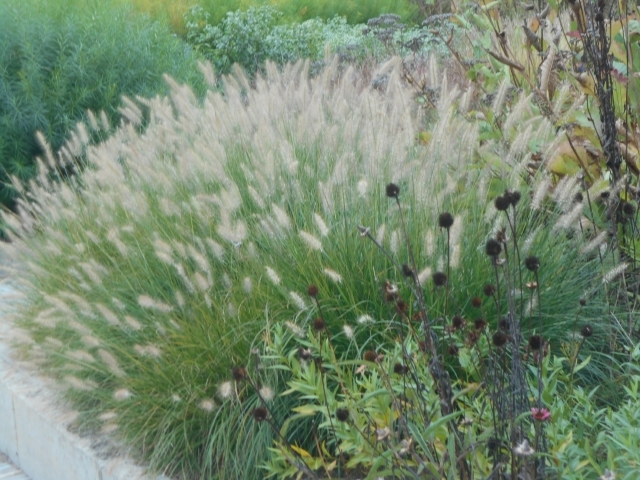 He masses drought-tolerant plants in combinations and waves that create vistas. He has an artist’s eye that expects plants to obey, so he doesn’t need to remove and regroup languishers, dig up and replace thugs. He doesn’t limit selections to prairie natives, either, though there are many here. This meticulously designed prairie look-alike is populated with plants from all over the world. The garden is named for Ann Lurie because she donated a ten-million-dollar endowment for its care. Would that we could all have endowments for our gardens. Volunteers, too, help with maintenance. Hmmm. Wouldn’t we love to volunteer here and shake out a few seeds for planting back home. No, don’t even think about calling us out, we are not second-story rascals. Our hands were on the camera all the while. We enjoyed the garden so much on a dreary autumn day. How much more would it shimmer in warm weather when bulbs and perennials are in their prime. We will have to come back in spring.